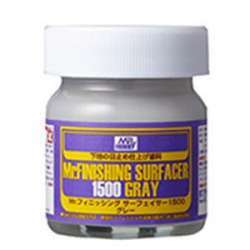 40ml bottle of Gunze Sangyo (Mr Hobby) Mr Finishing Surfacer 1500 - gray. 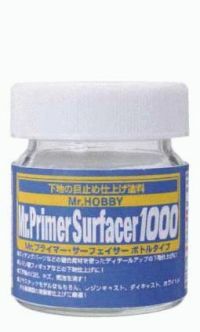 Mr Finishing Surfacer is an ultra-fine version of Mr Surfacer liquid filler/primer and is ideal for final finishing. It is quick drying and can be applied by brush or it can be airbrushed. An essential addition to any modeller's tool box.